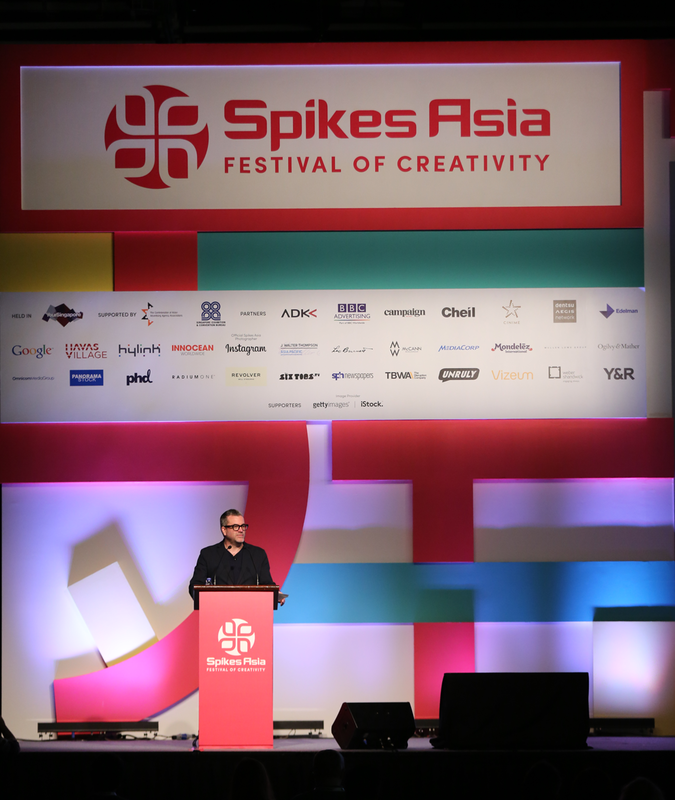 Three days at Spikes Asia 2015 provided ample proof of creativity coming out of Asia. From the classical TVC’s and Hong Kong nostalgia to the wacky robots and androids coming out of Japan, there was certainly a lot of creative stuff presented on stage. Was it all relevant and will it create a relationship between brands and customers? Social and technology is clearly changing the way ad agencies work, or does it? Advertising has traditionally been about getting people to say wow! Mixing social media and more technology into the mix does spur new creative ideas, that much is clear at Spikes. But all too often there is a wow moment and then you wonder, what brand was it for again? It is interesting to see how even the most traditional advertising agencies and media houses have embraced or claim to have embraced social and technology. Work by Isobar and Ogilvy for Coca-Cola was showcased on day two and provide excellent examples of how technology and social can be combined into new ways to sell and to sample Coca-Cola. The Slender Vender e.g. turned into the worlds smallest, not to say slender, vending machines. Although in the end, due to the lack of space on the front, the decision was taken to not sell the coke, so it turned into a sample machine, distributing Coke Zero for free. 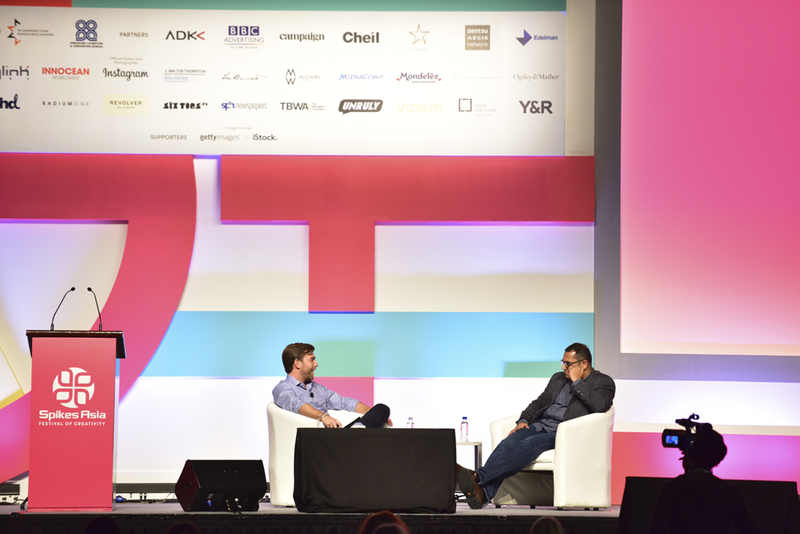 From left: Sven Huberts, Managing Director, Asia-Pacific, Isobar and Pratik Thakar, Leading Creative Content and Design Excellence APAC & ASEAN, The Coca-Cola Company. By putting the Slender Vender into tiny places, even in between two other vending machines, the design aspect was optimally integrated with the communication strategy. Another tactic let consumers download an app which can then be ‘filled up’ with virtual Coca-Cola. Once filled the app generates a coupon that could be redeemed for a real Coca-Cola at a POS. Both campaigns were of course amplified on social media as well as the classic channels like radio and TV. More extreme were the examples by Dentsu. 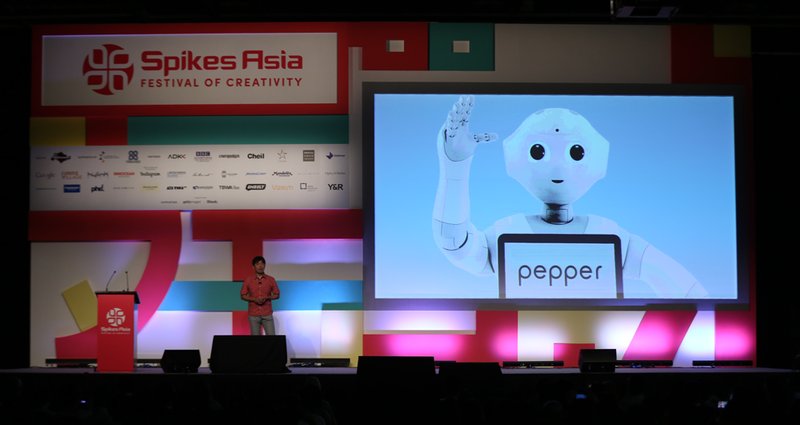 They confirmed their phenomenal reputation in and outside Japan when they showed how they contributed to making Pepper a cloud-enabled robot, capable of recognising human expressions and responding in a very human-like way. The making of the Matsuko-droid, based on Matsuko, a popular cross-dressing Japanese tv-host, shows how brilliant and downright creepy robots can be. The android version of Matsuko can imitate, or should we say produce, facial expression and conversations so well that people start approaching him/it as if it was real. They even put him on a Japanese train in a front seat, with screaming fans on the station-platforms as a result. Yasuharu Sasaki, Executive Creative Director, Dentsu Inc. In the mind of Yasuharu Sasaki, Dentsu’s executive creative director, we should not be afraid of robots taking over because creativity will always be needed. He has a point until we’ve taught robots enough to be creative. Let’s hope that we’ll always beat them to it. Not convinced that tech is rapidly changing the way advertising works? Take the classic photo shoot. Photographer Vincent Laforet, initiator of the ‘Air’ project. He told the audience how digital hi-res cameras changed the way he works. Each still of a hi-res video has now the quality of a photo, so instead of taking pictures he takes short movies and then selects the still that captures the moment the best. It takes the guess work out of photographing and turns shooting into choosing. 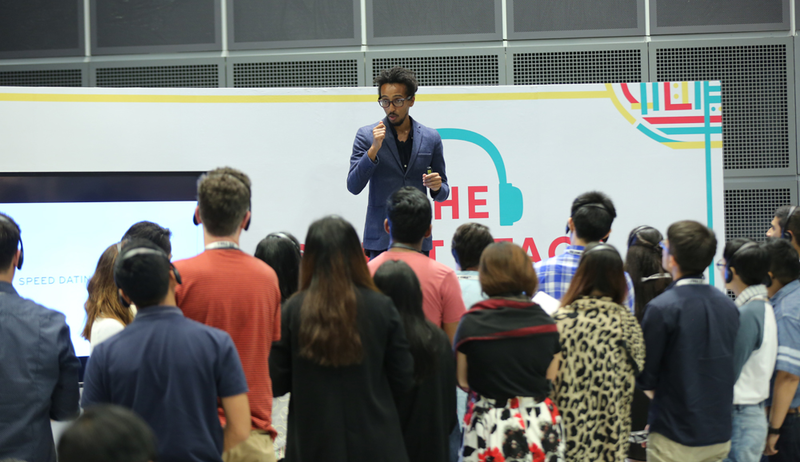 Abraham Abbi Asefaw from the Pop Up Agency presented on the Inspiration stage and the Silent stage why they claim to solve any creative brief in 48 hours. The methodology comes across as an abbreviated Design Thinking session on steroids. It is not hard to understand why it could work but the claim that any creative brief can be solved this way does not hold in my opinion. That said, the fact that Pop Up challenges the traditional ‘brainstorming’ sessions is maybe one of the reasons why they are the only advertising agency in the Hi 100, alongside brands like Pixar, Spotify, Ideo, Apple Airbnb and Tesla (#1). The Hi100 are the 100 most sought after employers, chosen by students of Hyper Island in Stockholm. Abraham Abbi Asefaw, Founder, Director, The Pop Up Agency. 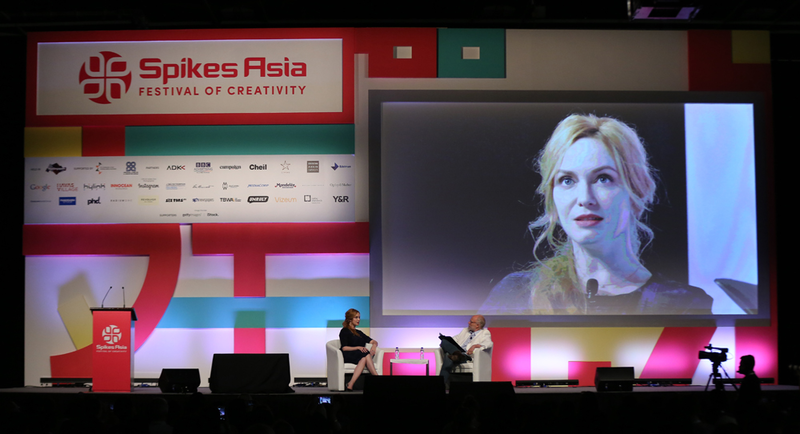 Mad Men actress Christina Hendricks was interviewed on stage by Gordon Bowen, founder of agency mcgarrybowen, which is part of the Dentsu Aegis Network. Charming and tranquillising like green tea after a foot massage, Christina talked about her approach to acting and what made her decide to accept the role in Mad Men in the first place. Yet I am not sure what the session taught us and how it was helping anyone being more creative. That said, it was a welcome alternative to some of the ‘look at the greatness of our work and admire us please’ type of sessions. Actress Christina Hendricks and Gordon Bowen, Founder, Global Chairman & Chief Creative Officer, mcgarrybowen. Are we still in advertising? That social media can lead to social responsible actions that really impact culture was brought forward by both Twitter and Aaron Haroon Rashid, creator of Burka Avenger. The unravelling of the Burka Avenger Animation was perhaps the most interesting session at Spikes and one that makes you wonder whether this is advertising. It is truly fascinating to see how a local Aaron, a VIP in Pakistan who became popular as a musician, decided one day to do something against extremism in his country and to stand up for female empowerment. 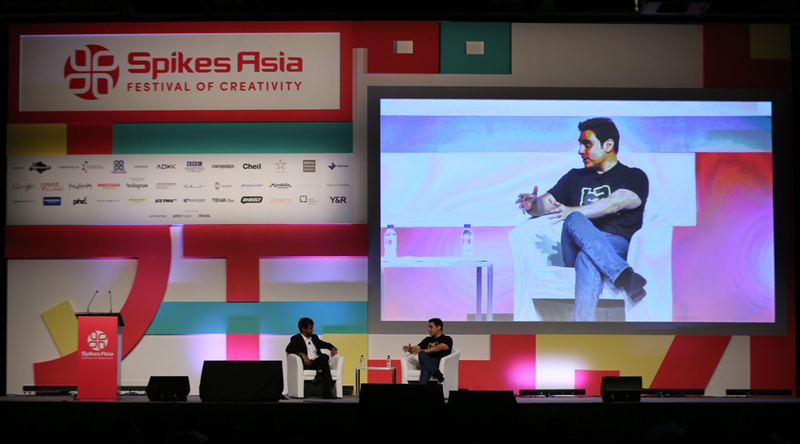 From left: Ali Shabaz, Chief Creative Officer, Grey Group Singapore and Aaron Haroon Rashid, Founder, CEO Unicorn Black, Creator of Burka Avenger. In a laid back but very focused style he explained that he was shocked by the closure of girl schools in Pakistan’s country side. He decided to create a television series around Burka Avenger. This lady is a school teacher by day but in line with Superman and Spiderman style stories, she becomes a super hero with super powers as soon as she dons her burka outfit. Burka Avenger has won many awards so far and is an example of how technology, creativity and storytelling can be used for a greater good. The series are not only immensely popular in Pakistan but are starting to find their way into neighbouring countries and even the rest of the world. Most interesting bit is that this was produced on a very small budget and that social media channels were used primarily to communicate and market the series. After the launch they had 3 million visitors on their website in the first two days. Again, you may wonder if this is advertising. In my mind this is more about creating a brand while starting a movement and also an impressive achievement by any measure. Steven Kalifowitz, Global Brand Strategy, Twitter. The first day closed with a session by Steven Kalifowitz, responsible for Global Brand Strategy at Twitter. He pointed out some of the obvious advantages of engaging customers in campaigns using Twitter. He made it poignantly clear how powerful social media can be, using the humanitarian aid that emerged after people started sharing the image of a refugee selling pens, while carrying his sleeping daughter. The resulting #buypens hash tag led to a Kickstarter campaign that helped the father finding a place to live. This moving example shows again how crowd funded campaigns can change people’s life overnight and can be used for more than brand and consumer engagement. These sessions are what makes an event like Spikes Asia more relevant and take it beyond overpowered showcases of beautiful brands with beautiful people. I would love to see more of these social responsible campaigns next year. There were a few sessions about talent, leadership and the lack of women in agency positions. It is interesting to hear that the agency industry is wrestling with these topics in a similar fashion as other sectors do. It was not so clear whether Spikes provides the right audience and platform for these topics. Another session about JWT and TNS on why consumers do not necessarily want to engage with brands brought also more of the obvious and at times already over discussed topics to the stage. It strikes me as if the presenters and their agencies are maybe struggling with this. Most of the marketing and advertising people I talk to, understand completely that engagement is more than a Like on a Facebook page and comments on a video. As pointed out before, a lot of the campaigns at Spike do create a wow effect but it seem to lack a clear engagement strategy in their slipstream. Mondelez Sessions (from left): Pete Mitchell, Director Global Media Innovation, Mondelez International and Bant Breen, Founder, CEO, Qnary. More interesting was the statement of Pete Mitchell, director of global innovation at Mondelez. He said that China is way more advanced in data analytics for marketing because there are fewer restrictions. This is an interesting observation that led to some head scratching in the audience. Should we have fewer restrictions but does that then not lead to more intrusive campaigns? A conference room full of agency people waiting for their 30 seconds of fame, a hostess with the turbo on, presenting at full speed and most of the audience sitting there with nothing more in their stomachs than a few peanuts and an 18 dollar drink, gives you an impression of what the awards ceremony felt like. I understand the awards ceremony is the most important part of Spikes, both for the organisation and the participants. But the absolute overwhelming amount of information, categories, names and ads thrown at you does not help to discern the good from the great nor the bad or the ugly. 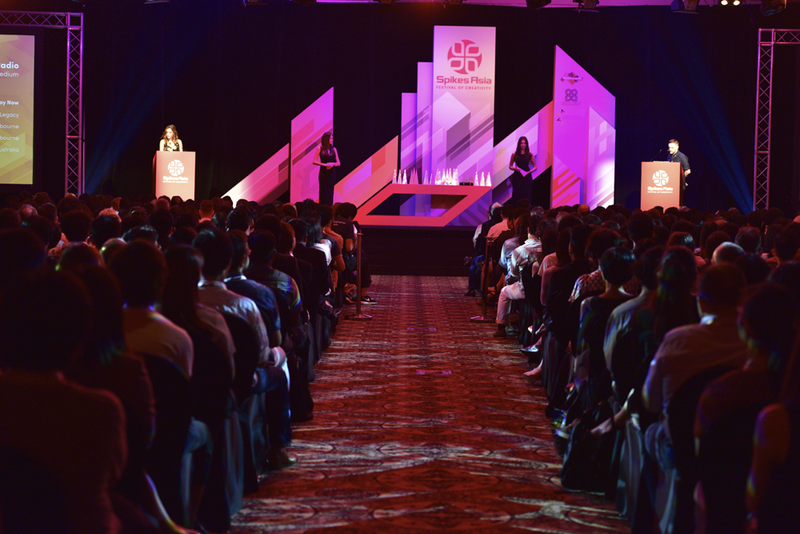 Spikes Asia Award 2015 Ceremony. Yes, there were some great ideas, like the Volkswagen Reduce Speed Dial campaign or the Reverse April Fool’s day commercial for BMW. Also the Life Saving Dot campaign is more than just advertising as it has a social component. But overall it is difficult to understand who won and why. The way the juries came to their verdicts is not published so we can only guess what the deciding factors were. The ceremony underscores what advertising does well. Creating a wow effect, making brands and people shine. Most campaigns do not leave a lasting impression but it does provide the 30 seconds of fame on stage for those working on the campaigns. Interesting enough, those that do, like Burka Avenger or #buypens are not even advertising campaigns and are not created by agencies. So if agencies want to be and stay relevant in an increasingly complex world it is time for a thorough revamp. Will we be back again next year? Yes we would love to. 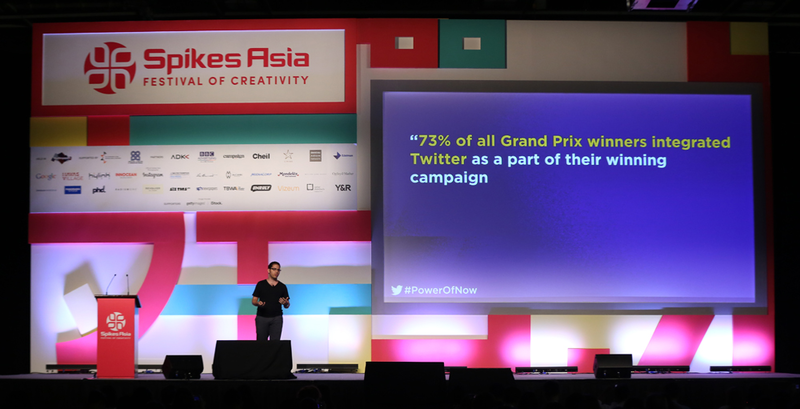 After all advertising is here to stay and Spikes still is the prime event in Asia to sample the state of the industry.